What does love mean to you? 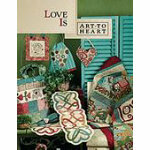 You will find new ways of expressing your love with the block of the month fusible applique quilt, quilting bag, placemats, table runner, heart bags and stitcheries. The book is from Art to Heart.